NASC members recorded 113 accidents and injuries on site during 2018 – equating to one incident for every 150 operatives. The figure was revealed in the NASC 2019 Safety Report, which documents and analyses accident and injury statistics for its full contracting members in the previous calendar year. The 113 injuries recorded means that more than 99% of all NASC member operatives – a total of 16,645 employees – went through 2018 accident and injury-free. There were also no operative fatalities last year, for the sixth consecutive year. The NASC report shows that the most common cause of accident and injury was ‘Slips, Trips and Fall on the same level’ – representing more than 43% of all accidents reported. There were 22 falls from height, up from 14 in 2017, and four falls of materials, down from 12 in 2017. Des Moore, CEO of TRAD Group and NASC President, said: “The report shows that NASC members and their operatives continue to work incredibly safely at height. “While it is slightly disappointing to see a slight year-on-year rise in the number of reported incidents, it is important to view this figure in context – taking into account the 16,000+ operatives who completed millions of working hours in 2018 without injury. “Indeed, the annual incidence and frequency rates remain incredibly low, demonstrating how much value NASC full contracting members place on implementing and enforcing safe working standards on every project they undertake. “However, there is always room for improvement. This is why the NASC will use the data collected to drive positive change – looking for ways to lead safety in our industry and help our members continually improve H&S standards on sites and in yards across the UK. Robin James, NASC Managing Director, added: “The NASC believes wholeheartedly in safety leadership, accountability and transparency, which is why it goes to such great lengths every year to collate, analyse and publish a detailed safety report to enable the NASC to focus on strategies and guidance to improve the scaffolding industry. To read the NASC 2019 Safety Report click here. A six-figure fine handed down to a developer after a boy fell from a scaffold ladder has highlighted the need for contractors to ensure they take steps to prevent unauthorised access to their sites. Westdale Services Limited received a £160,000 fine at Cardiff Magistrates Court after the 12-year-old suffered life-changing injuries in the fall. 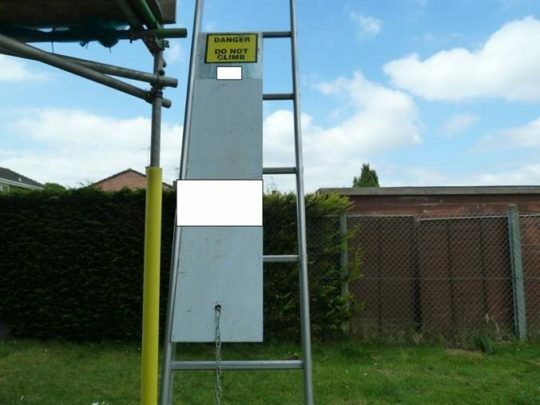 The court heard how two boys climbed the rungs of a ladder within scaffolding erected by Westdale Services Limited at Southville Flats, Cwmbran, by placing their feet either side of a ladder guard that did not fully cover the rungs of the ladder. One boy climbed to the top platform of the scaffold and climbed the uppermost ladder to a height of approximately 10 metres. The ladder slipped, causing the boy to lose his balance and fall to the ground. The boy now has no bladder or bowel control and is only able to walk short distances due to being unstable on his feet. An investigation by the Health and Safety Executive (HSE) found the security arrangements for preventing access to the scaffolding, especially by children from a nearby school, were inadequate. Westdale Services Limited of Doncaster Road, Askern, Doncaster pleaded guilty to breaching Section 3(1) of the Health and Safety at Work Act 1974 and were subsequently fined £160,000 and ordered to pay £22,310 in costs. Speaking after the hearing, HSE inspector Michael Batt said: “The death or injury of a child is particularly tragic and a lot of thought must go into securing construction sites. Children do not perceive danger as adults do. The potential for unauthorised access to construction sites must be carefully risk assessed and effective controls put in place. It is Mr Batt’s prevention advice that the NASC is keen for all principal contractors and scaffolding contractors to take from this incident. The NASC has guidance on the use and storage of ladders on scaffolding; SG25:14 Access and Egress from Scaffolds via Ladders & Stair Towers. This document was revised in June 2018 to incorporate a new image showing a ladder guard that fully covers the rungs of a ladder rungs left in situ, preventing anyone from scaling it. A completely updated guidance, SG25:19, will be released later this year. SG25:14 is available for free download via the NASC’s online shop here. The Construction Industry Scaffolders Record Scheme (CISRS) is marking the second anniversary of the introduction of CPD courses for scaffolders by running a number of subsidised courses across the UK. CISRS has reached an agreement with a number of training providers that will enable them to deliver the CPD programme for just £50 (or even less in some cases) for around 250 delegates across the UK this summer and autumn. CISRS will also waive the usual costs of the delegate training folders and card application fees normally incurred in the delivery of these courses. The two-day CPD programme for CISRS card renewals was introduced in July 2017. Despite some initial resistance, the course has proved to be very successful. As more and more delegates go through the programme, (current figures are approx. 6000 operatives) it is evident from course feedback that CPD is valued by scaffolders as important refresher training. As a not for profit organisation, CISRS continues to look for positive initiatives such as this to redirect some of its income. They will be injecting over £65,000 mainly raised via CISRS Overseas Training back into the UK sector. Dave Mosley, CISRS Managing Director, said “We would like to thank all of the providers who are taking part in this promotion, we really appreciate their support it allows us to give something back to industry. Course dates and centre contact details can be found on the CISRS website here. Bookings will be taken directly by the training centres. The CISRS training scheme is growing in the UAE in terms of both availability and demand. CISRS representatives were in Abu Dhabi this week to carry out a pre accreditation visit at Safety & Access and Aecor’s new training centre. This facility will deliver Level 1, 2 and 3 scaffolding training, Basic Scaffold Inspection, Supervisor training and CPD courses once in becomes operational in four to six weeks’ time. 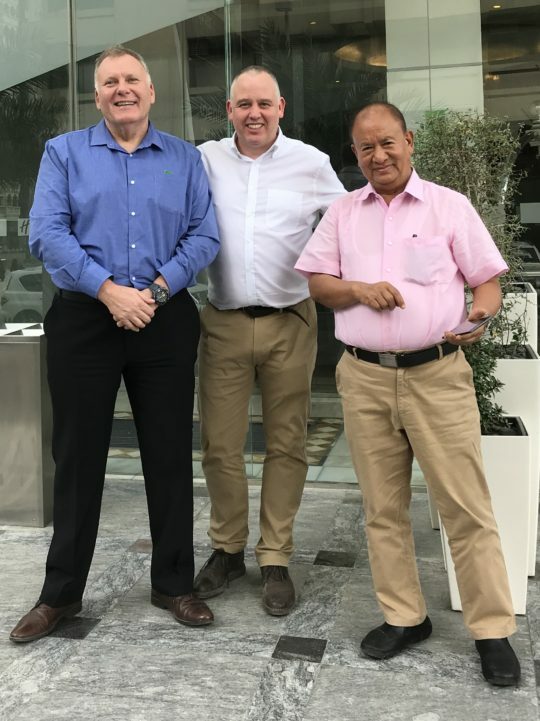 Whilst in the region, CISRS held meetings with two major construction companies to promote the CISRS Overseas Scaffolder Training Scheme (OSTS) and the new centre. CISRS officials met with Consolidated Contractors Company (CCC), the largest engineering and construction company in the Middle East with more than 110,000 employees, and Target Engineering Construction Company, which is involved in projects in civil, mechanical, marine construction, electrical – power and instrumentation / control works and MEP works for both onshore and offshore-based oil and gas sectors and the commercial sector. In Dubai, Simian Skill passed the CISRS OSTS annual accreditation visit with flying colours. Training numbers are up year-on-year at the facility, which delivers Level 1 and 2 scaffolder training, Basic and Advanced Scaffold inspection, Scaffold Supervisor training and even a CPD course for UK ex-pats. David Mosley, CISRS Managing Director, said: “It’s great to see increased interest in CISRS OSTS both in the UAE and further afield. It’s a real positive step that major clients are becoming more aware of CISRS OSTS and looking to implement it for their workforce. Safety & Access and Aecor currently operate training centres in Nepal and Qatar. As well as Dubai, Simian Skill instructors are delivering training around the globe, including in Abu Dhabi, Qatar and Nigeria. CISRS has increased availability of CPD courses, in response to industry demand. The rise in CPD training provision will be generated by allowing core scheme centres – those offering Pt1, Pt2 and Advanced CISRS courses at their main training centres – to deliver CPD at their network of facilities across the UK. These centres must have sufficient space to house the inspection structures and carry out the mobile access tower module, suitably qualified instructors, and approval from CISRS prior to any training taking place. This change has been made following a recent review of course availability and centre capacity, in which a shortage of CPD courses was identified in some areas. This increased availability is expected to alleviate this issue, however CISRS will continue to review the situation. Please refer to the CISRS Training Centre listings here for updates in centres available CISRS courses. Hundreds of youngsters were able to explore the opportunities that the scaffolding sector has to offer at the fourth-annual Give Construction a Try event. NASC and CISRS both exhibited at the one-day careers showcase, held at Wakefield College to give schoolchildren a better understanding of construction trades available to them. 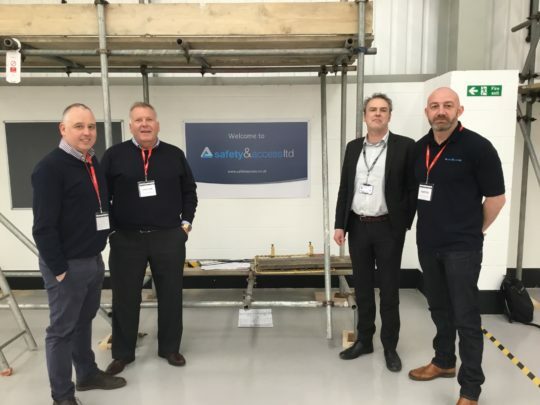 The NASC was represented by members Wes Johnson and Nathan Croft of Scaffolding Access Solutions, Jonathan Gaunt and Mike Todd of Altrad Generation UK as well as Henry Annafi, NASC Training Officer, and David Mosley, NASC Director of Training and CISRS Managing Director. 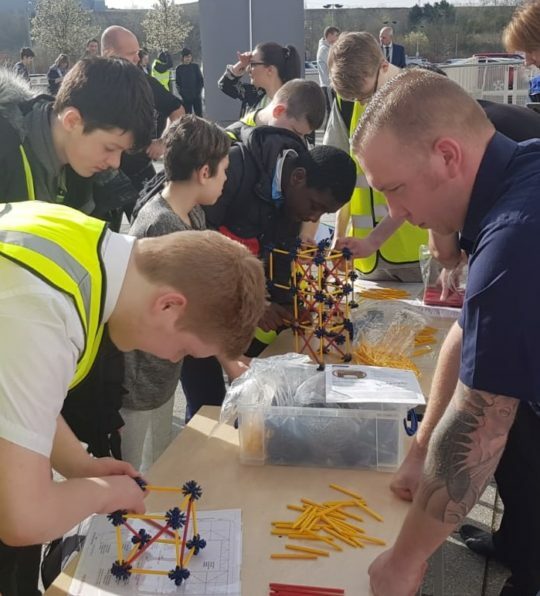 More than 300 students from 31 schools were able to get to grips with scaffolding tube and fittings and also test their engineering skills by making mini scaffold structures with K’Nex. The NASC team also promoted the wide-ranging careers available to youngsters in the scaffolding industry, including scaffold design, procurement, estimating, health and safety and inspection. Jonathan Gaunt, Training Manager at Generation UK, said: “Give Construction a Try is a great way of showcasing the many skilled careers available in scaffolding and construction. “The UK has many great companies operating in scaffolding and construction all in need of talented people to help fulfil their projects and this demand is growing year on year. No matter what their academic ability, background age or gender, there are jobs available across the industry and this is something that young people do not has any exposure to until leaving school. David Mosley added: “This event was somewhat of a bitter sweet day for us. While it was great to once again engage with so many youngsters across the region and give them a greater understanding of the careers they could pursue, it was sad as long-standing NASC Health and Safety Committee and ASITO member Mick Shepherd of Complete Access Scaffolding Ltd was not there with us. “Mick, who passed away unexpectedly earlier this year, was integral to the promotion of this event, fusing his passions of scaffolding, construction, providing careers support to youngsters and rugby into one showcase. Brigshaw School was awarded the Mick Shepherd Trophy, presented to the school that most actively embraced the various activities available at the event. 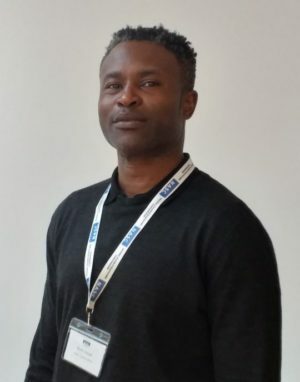 The National Access & Scaffolding Confederation has strengthened its learning and skills capabilities through the appointment of a new training officer. Henry Annafi brings a wealth of training, apprenticeship and stakeholder engagement expertise to the NASC team, having previously managed multiple high profile training initiatives for the public and private sector. In his new role as NASC Training Officer, Henry will support members with any training issues they may have and also encourage more people to take up positions in the scaffolding industry. Robin James, NASC Managing Director, added: “I am really pleased to welcome Henry to the NASC. His role will see him working with the members, but also with third parties to address industry training needs and access additional funding opportunities. 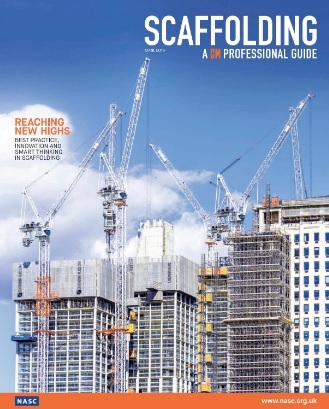 The NASC is delighted to announce that the inaugural issue of Scaffolding magazine, published on behalf of the National Access & Scaffolding Confederation (NASC) by Construction Manager, is now available. It can be read here. Hard copies come free with the March edition of Construction Manager. Robin James, NASC Managing Director, said: “The aim of this publication is to further strengthen ties between the NASC, the trade body for access and scaffolding in the UK, and the wider construction industry by providing an insight into the expertise and cutting-edge innovation of NASC full contracting and non contracting members. “The NASC strictly audits its members every year to ensure compliance with NASC Criteria, Code of Conduct and Code of Practice for scaffolding products. 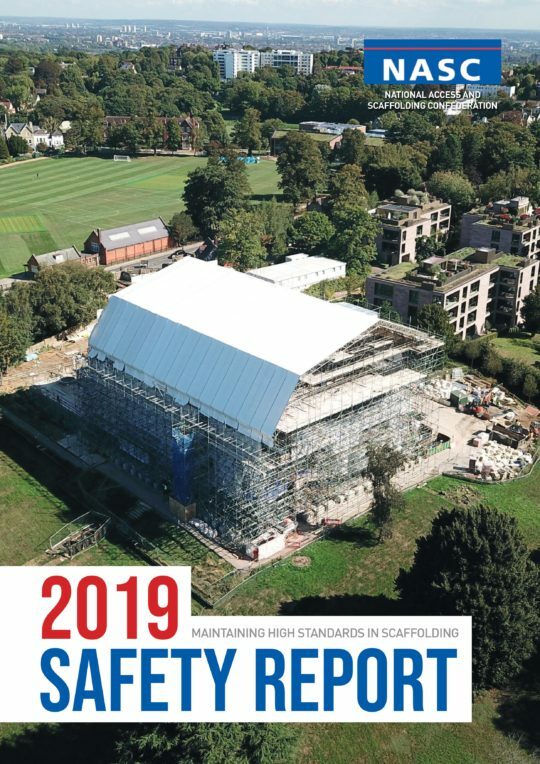 These high standards are recognised and valued by construction industry leaders, who are stipulating ‘NASC’ only’ companies for access and scaffolding in increasing numbers every year. Contractual guidance notes focused on the hiring of hoists and contract clauses have been updated and amended. 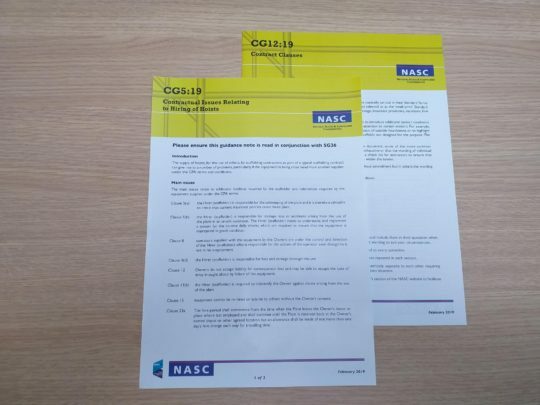 CG5:19 Contractual Issues Relating to the Hiring of Hoists and CG12:19 Contract Clauses were reviewed and amended by the NASC Contracts Committee as part of the NASC’s ongoing efforts to ensure all reference materials remain up-to-date and fit-for-purpose. They are all available for purchase via the NASC online shop here. A new guidance note – CG20:19 A Guide to Monitoring and Chasing Debt – is currently being finalised and will be published in the summer. As the title suggests, the 12-page document provides assistance with the control and collection of debts. Robin James, NASC Managing Director, added: “We are pleased to have updated two further CG notes and adding another commercially beneficial title in the coming months. CISRS scaffolder training in the capital has been boosted through the opening of a new facility near Wembley. The new Park Royal training centre is situated on the West London College Campus, which offers a diverse range of construction-related courses. Managed by Safety and Access, the centre will host a number of CISRS courses including the COTS New Entrant Course, Basic Scaffolding Inspection Course and the Manager and Supervisor Course. There are also plans to introduce the CISRS Scaffolder CPD and System Scaffolding courses in the near future. David Mosley, CISRS Scheme Manager, visited the new facility earlier this week and said CISRS accreditation would be finalised in the coming weeks. “This modern, well equipped centre is a very welcome addition to CISRS delivery in the West London Area,” he said. “Safety and Access has a long and proven track record as CISRS provider and I am sure they will be successful in this new venture with the college.